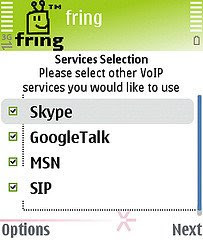 "Fring" is a Mobile Internet communication Software. Here You can Chat and call to your friends with Skype, MSN Messenger, Google Talk, ICQ, SIP, Twitter, Yahoo! and AIM. "Fring" combines multiple IM contacts into one dynamic profile which shows each friend’s current availability at a quick glance and enables interaction, all directly from this combined mobile profile. "Fring" will automatically logging into your WiFi spot without having to configure your WiFi access points each time. 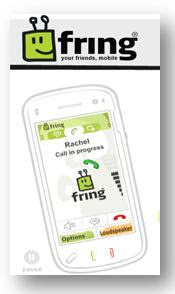 the new fring version 3.40 .